Parents and teachers have the awesome responsibility of being the first to share God’s Word with children. Teaching the Bible doesn’t have to be intimidating, and for nearly 50 years, Arch Books have provided a great guide for better explaining Scripture. Beginning with the story straight from the Bible, our authors and illustrators dig into authoritative resources, seeking to present the story in a Scripturally and historically accurate way. Every book reflects what we know from God’s Word. By showing children traditional clothing and examples of biblical buildings and landscapes, Arch Books provide content that children will remember during their lifetime of learning. While our Arch Book authors and illustrators are many and diverse, we have a unified goal—proclaiming God’s Word to young people. Our passion is to equip families and educators with biblical stories that will leave an impression on children, so they share these truths with friends, and in the future, their own children. We’re committed to coming along on the faith-teaching journey with new books released every year. Arch Books are a very practical way for adults to help build and strengthen the biblical literacy of children in their life. Our hope is that these stories will serve as a starting point for a child’s lifelong study of God’s Word. When Arch Books are used at home, church, or school, we know children are blessed by the best message there is—the promise of salvation through Jesus. What joy! 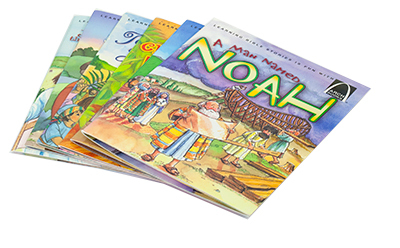 Traditionally, this favorite series is used in the home, school, and church with children ages 5–9. Most children at this age can easily understand and apply the stories with the help of adults. But the blessing of Arch Books isn’t limited to any age! To learn specific ways to use these stories with children ages 2–12, visit our For Home, For School, and For Church pages. Happy 50th birthday, Arch Books!